I always met two kind of young parents : the ones who said that having children did not prevent them from leading their fulfilling existence, and the ones who kept repeating how « it changes your life », this sentence being immediately followed by a suspicious« but you don’t want to do without them ». I was deeply convinced I would adhere to the first kind, but when my daughter got one year, I had to face the fact that I had ended up abandoning all about what I dare call « my previous life » (except maybe for the work pressure but that’s another story). And I started hating those people who were probably trying to help with advices such as « you should be able to go everywhere with your child », “JUST take her with you”,… and even more those other parents having a nice chat in a restaurant, their little baby asleep in its stroller, or (peak of coolness) in a sling around their neck. Truth is, I didn’t dare going anywhere with Emma. I remember her first 3 months : cries, cries, cries, wet feet walking in the rain to get her to sleep in her stroller, and cries when I tried to stop (please remember me to post a map of Brussels’s best cobbled streets to lull a baby to sleep). Then eventually it stopped. It was summer. I was still pushing the stroller, but sometimes she didn’t wake up when the swinging was interrupted. 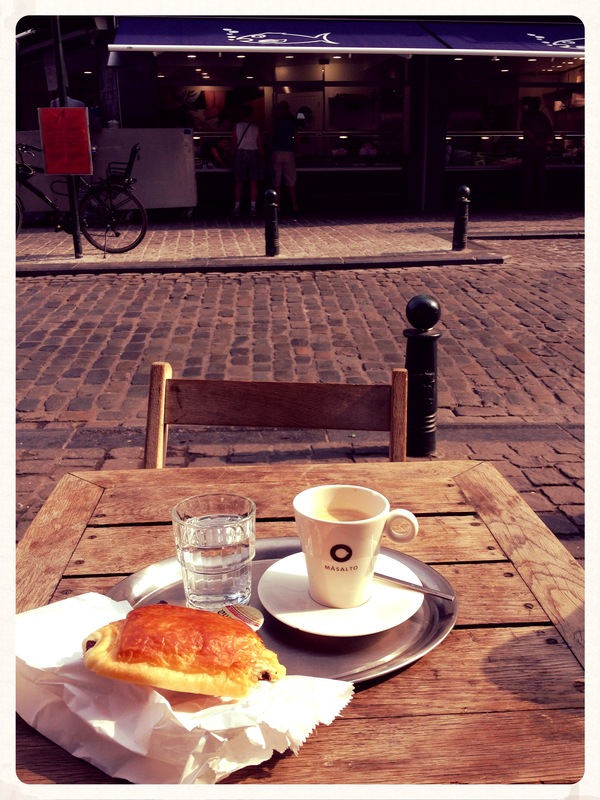 I remember my first cup of coffee on the terrace of the Monk, with one of Charli’s croissant, quietly watching the ‘Oostendenaren’ from ‘Mer du Nord’ preparing their fish stalls for the 10 o’clock apero. I was happy, chilled and happy. ‘Cos that’s what I used to do, you know? My life in Brussels! I was looking at it through window panes which reflected a chubby me pushing the damn troller. I started to understand that I would not get my life back as soon as I had expected (please don’t say “never”). I could keep waiting for it, or start a new one. A life in Brussels with Emma. But I was tense and inhibited. I used to haaaaaaaate being at the restaurant after a week hard work and have to hear a crying newborn in my back or a 2 years old slamming its spoon on the table. Actually I still do. I cannot relax and have a good time seeing Emma disturbing other people. And try having a decent conversation with a friend and a bored baby in a bar. Or enjoy an exhibition when you are not sure when it is gonna wake up/get hungry/get angry. I tried googling “childfriendly Brussels”… but it didn’t help much. How many times can you go to Mini Europe or Brupark? So I started setting up such an address book of my own. Spotting restaurants with baby chairs / changing table, trying out swimming pools with paddling pool and other kid/babyfriendly activities … we had some dreadfull experiences, but I forced myself to “dare trying”. But I needed an incentive to keep on. I thought about a blog. If there are some other mothers in Brussels who don’t feel comfortable taking their baby to public places or would simply be interested in some tips about things to do/places to go with their little devil(s),… it would feel good to help. Anyway I got kind of excited by the idea and this is the beginning of the poor adventures of a “freaking mother in the city”.